Be the first to review this 2018 GMC Sierra 2500HD. GMC Sierra HD heavy-duty pickups are closely related to the Chevrolet Silverado HD and are available with more luxurious cabins and features. Most models sold are four-door Crew Cabs with ample room for adults. Of those, most are costly Denali editions with posh appointments. Following a redesign for the 2017 model year, the Sierra HD has changed little for 2018. Base Sierra HD models get a standard rearview camera and a 7.0-inch touchscreen, while Denali models gain a new grille. Silverado and Sierra pickups share many powertrain components. The 2500HD has a 3/4-ton rating, versus one ton for 3500HD models. Sierra HD trucks come in four trim levels: base Sierra, SLE, SLT, and Denali. Regular Cab, Double Cab, and Crew Cab models are available, but Denalis are Crew Cab only. Regular Cabs lack a back seat, while Double Cabs have a narrow rear bench and rear-hinged partial doors for access. Crew Cab trucks have four conventional front-hinged doors. An 8-foot cargo bed is available with all cab configurations. Double and Crew Cab models can have either a 6.5-foot bed or the 8-foot length. Stripped-down base Sierras come only with a Regular two-door cab and 8-foot bed. Few are sold. GMC’s standard 6.0-liter V8 makes 360 horsepower and 380 pound-feet of torque, driving a 6-speed automatic transmission. Towing capacity of a Crew Cab rear-drive 2500HD with a conventional hitch reaches 13,000 pounds. Payload tops two tons in some configurations. Introduced for 2017, the optional 6.6-liter turbodiesel V8 produces 445 horsepower and an energetic 910 pound-feet of torque. Towing capacity can exceed 18,000 pounds, depending on configuration. Roughly 90 percent of Denalis are diesel-powered. Rear-drive is standard, with four-wheel drive optional. Like other heavy-duty trucks, Sierra 3500HD models are available in single- or dual-rear wheel configurations; 2500HD pickups come only with single rear wheels. Crash-test results could be better. The National Highway Traffic Safety Administration gave the Sierra 2500HD a four-star rating overall and for frontal impact, but a five-star score in the side-impact test. Rollover protection drew only a 3-star rating - typical of vehicles with tall ride height. All Sierra HD models include a rearview camera, but advanced safety features are limited. Denali models add standard forward-collision and lane-departure warnings, along with front/rear parking sensors. Those features are extra-cost options on SLE- and SLT-trimmed Sierras. A Teen Driver Alert can report driving behavior of youngsters to parents. SLE adds keyless entry, a 4.2-inch driver information display, remote-locking tailgate, and 8.0-inch touchscreen. SLT gets leather upholstery, dual-zone climate control, 18-inch wheels, and remote start. SLT can be fitted with an All Terrain X HD off-road package, featuring full blacked-out treatment. Denali comes with heated/cooled leather front seats, a heated steering wheel, 20-inch wheels, an 8.0-inch driver information display, wireless phone charging, Bose audio, front/rear parking assistance, navigation, and a suite of advanced safety features. Sierra designers managed to blend sharp corners, creased fenders, and a modest sense of western adventure with a conservative demeanor. GMC’s HD truck is actually the most conservative member of the heavy-duty pickup category. Basic design amounts to a stretch of the lighter-duty Sierra 1500 (half-ton) pickup. Tall grilles emphasize the Sierra’s modern appearance. The Denali’s reworked grille is a three-bar design, edging aside the previous honeycomb pattern. Diesel-powered models are fitted with a functional hood scoop. Essentially restrained in nature, Sierra cabs largely echo those found in Chevrolet’s Silverado HD series. Most GMC heavy-duty trucks are high-dollar Denali or midrange SLT editions, with leather upholstery and abundant comforts. Sizable Sierra HD trucks blend impressive tow/haul capability with satisfying comfort, especially up front. In Double Cab models, the narrow bench in back is suitable for adults, but mainly on shorter treks. Legroom totals an adequate 34 inches, but seats are more upright than those in Crew Cabs. In terms of functionality, GMC’s infotainment system is identical to Chevrolet’s. Easy to use, it includes Android Auto and Apple CarPlay compatibility. Unlike heavy-duty Ram pickups with coil springs all around, Sierras retain a leaf-spring rear suspension. 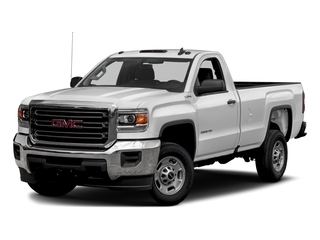 As a result, the GMC HD pickup is more suitable for towing and hauling duties than for overall passenger comfort. Maneuverability is hardly a strong point, but no full-size truck can be said to handle well. Ride comfort might earn no awards, but rival makes aren’t exactly smooth cruisers, either. Like all pickups, Sierras and their Chevrolet Silverado cousins ride better with weight in the bed, above the rear tires. Performance from both big V8 engines helps make the Sierra one of the most capable trucks available today. The 6.0-liter gasoline V8 exerts admirably strong pull. Torque output from the 6.6-liter turbodiesel places that version among the most powerful road machines. Road noise is nicely subdued. Clatter from the big diesel engine is nearly nonexistent in the Sierra. As for fuel economy, the Environmental Protection Agency does not develop estimates for heavy-duty trucks like the GMC Sierra HD. In real-world highway driving, a diesel-powered Sierra 2500HD approached 19 mpg. GMC Sierra HD pickups are comfortable, quiet and highly capable. Denali versions are luxurious. 2018 GMC listings within 25 miles of your ZIP code. Find 2018 GMC listings for sale near you.